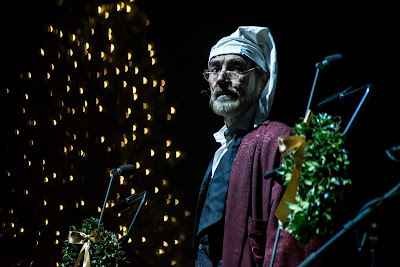 Just when it seemed like London couldn't get any more Christmassy, London Musical Theatre Orchestra's jubilant one night only concert production of A Christmas Carol lights up the Lyceum Theatre like a glorious dusting of snow on a winter morning. Based on Charles Dickens' famous novel, A Christmas Carol features music and lyrics by Alan Menken and Lynn Ahrens, and a book by Ahrens and Mike Ockrent. The famous story takes place on Christmas eve. Old miser Ebenezer Scrooge is visited by the ghost of an old friend, who warns him that if he doesn't stop his selfish ways he'll end up doomed. The sceptical scrooge is then called on by three other spirits, who show him his unfortunate past, the miserable present he has created for his overworked and underpaid employees, and the harrowing future he has in store unless he changes his ways. The story itself is a classic, having been told in many different forms over the years, but there's no doubt that transporting the story into musical form works brilliantly. Filled with jovial group numbers, lively instrumentals and gorgeous choral sections, the score more than justifies the existence of a musical adaptation of such a well known story. The orchestra itself, conducted by musical director Freddie Tapner, is absolutely first rate. The rich, sumptuous sound produced by the musicians, notable right from the overture, is extremely satisfying. Especially when they are playing with a such an impressive cast of singers, both principal and ensemble. The star casting of London Musical Theatre Orchestra's A Christmas Carol was no doubt a key factor in the show's sold out status. Robert Lindsay brings a smile to the face as Ebenezer Scrooge. Despite seemingly having a few timing issues throughout the show, his snide scrooge has a comedic vein and is impossible to hate entirely, despite his miserly ways. Meanwhile Alex Gaumond's gangly Bob Cratchit instantly endears, and a suitably unnerving and impressively voiced Norman Bowman as Jacob Marley elevates the music even further. Additionally, as the ghosts of Christmases past, present and future, Madalena Alberto, Hugh Maynard and Carrie Hope Fletcher are well cast, with Maynard in particular bringing infectious enthusiasm to his role. Despite being presented in concert form, London Musical Theatre Orchestra's A Christmas Carol has just enough theatricality to make it an engaging performance to watch as well as listen too. With a stage bookended by two dazzling Christmas trees, and wreaths adorning the music stands too, while Mike Robertson's lighting design gives the whole piece a warm, intimate feel. The London Musical Theatre Orchestra is an exciting addition to the London theatre community. Unbelievably, A Christmas Carol is only their second public concert, but with a new season already in the works, they're undoubtedly going to be an exciting addition to theatregoing in 2017!